This policy has been updated to reflect the requirements of PCI-DSS, Sarbanes-Oxley, HIPAA, and ISO. 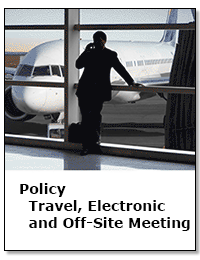 The policy comes as both a WORD file and a PDF file utilizing a standard CSS style sheet. Laptops can and do get lost or stolen. In studies conducted by several security firms, it has been found that over 50% of all lost or stolen laptops disappear at airport security checkpoints an departure gates. Unfortunately almost 70% of these laptops are never recovered. NOTE: This policy can be acquired as a standalone item or as part of the CIO IT Infrastructure Policy Bundle or the CIO Management Tool Kit. This product can be acquired with the standard 3 months of update service or with 12 or 24 months with upgrades. The upgrades can be acquired at the time of purchase or with special Janco offers. Individuals who acquire this product via a third party need to contact us directly to order the upgrade service. Individuals who acquire this product via a third party may or may not get the 3 months of update service depending on the the vendor it was acquired from.